A Face Movie is a slideshow for a person with his face as the focal point in the transition. 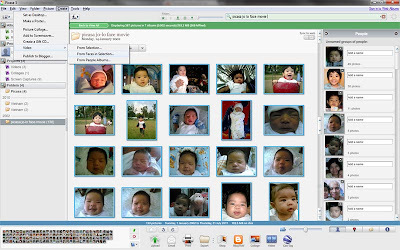 This feature is currently available in Picasa, Google's free photo management software. To show you how it is like, I have made a Face Movie of my son. The photos span six years. The first thing you might notice is that the photos are not in chronological order date-wise. Unfortunately, the system is currently unable to sort photos by date. It works by sorting through your selected photos and making the smoothest possible transition between each face. One tip, if you are concerned about having a smooth transition, is to have solo photos only. Picasa will include the faces of other people into the slideshow (therefore, a photo with three people in it will appear thrice). You may remove the other photos in the stream, but this disrupts the transition. Well, I have multiple faces on some photos because I like to include those, which is why I noticed the difference. My Picasa albums are not really that organized so what I did was to add a new album in my Pictures folder in Windows (which Picasa automatically detected and added to the gallery). In Picasa, I selected all the photos in this album (click on one photo then press Ctrl-A), then click Create - Video - From Faces in Selection (see screenshot at the start of this article). This will bring you to a big preview screen with thumbnails of the faces at the bottom. This is where you can right-click and delete the odd photo in the stream. Deleting here does not delete the photo itself, just its appearance in the slideshow. Then place background music if you want to. I got my nice bg music from Danosongs.com. When you're happy with the test run, click on "Create Video" at the right-hand side. Or if you want to upload it to YouTube as well, click on the YouTube button to automate that extra step! Login required, of course. This is a nifty application to use for birthdays, or just to play around with some photos and share with relatives and friends. I hope they come up with date sorting; that will be really cool.